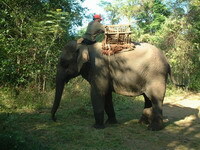 Discover Indochina is one of our most popular tours. This epic journey takes you through 3 very different countries and cultures. Arrival at the airport, you are met and transferred to the hotel. Luang Prabang is perhaps the best-preserved traditional city in Southeast Asia. The tranquility and charm of this town with its splendid natural scenery and cultural sights make it one of the most delightful places to visit in Laos. After a short rest, we visit the impressive stupa of Wat Visoun and the shrine of Wat Aham, Wat Mai; we then climb up to the top of Phousi Mount for an enjoyable exploration of the sacred, gilded stupa as well as a beautiful sunset view of the city and the Mekong River. From there, we explore Street Night Market, where you can find the lovely collection and handmade textile by local and hill tribe people surrounding Luang Prabang. Overnight in Luang Prabang. AM: After breakfast, we enjoy a short-guided tour seeing the city’s oldest temple of Wat Sene and the magnificent Wat Xiengthong with its roofs sweeping low to the ground, which represent the classical architecture of Luang Prabang temple. We then board a cruise upstream on the Mekong River, which also gives us a beautiful view of the tranquil countryside as well as an interesting visit to the mysterious of Pak Ou Caves, crammed with thousands of gold lacquered Buddha statues of various shapes and sizes. Along the way, we stop at the village of Ban Xanghai, where they make the distillation of local rice wine. On return, we take a short drive to Ban Phanom, well known for its hand weaving. PM: You will visit the morning Phosi Market where you will see such diverse offerings as dried buffalo skin, local tea and saltpeter among the chickens, vegetables and hill-tribe weavings. Laos is also known for its traditional crafts, and today you will visit local village of Lao ethnic minority groups at Ban Ouay, Hmong Village, Ban Ou, Laoloum Village and Ban Thapene, Khmu Village, then drive to the beautiful Khouangsi Waterfall where you can splash around in the pools or walk along the forest paths, return to Luang Prabang by late afternoon and continue to Ban Phanom, a well known weaving village, return to the city by late evening, for observing the sunset at Wat Siphouthabath. Overnight in Luang Prabang. The National Museum at the former Royal Palace, which displays a lovely collection of the artifacts reflecting the richness of Lao culture dating from the days of the early kings right through the last sovereign, and the Central Market Then transfer to the airpoprt for flight to Vientiane. Upon arrival, we see the major temples including the oldest Wat Sisaket, a temple of thousands of miniature Buddha statues and the former royal temple of Wat Prakeo previously housed the famous Emerald Buddha Image. On the way to the famous, sacred structure of That Luang Stupa, we stop to take some pictures of the imposing Patuxay Monument, which is Vientiane’s own Arc de Triumph, sunset by Mekong Riverside and late evening. Overnight in Vientiane. After breakfast, we visit the Morning Market and the weaving village of Ban Nong Bouathong (if time permits). The tour ends after your transfer to Wattay Airport for the flight to Hanoi. Pick up at the airport and transfer to Halong bay.Diner at the restaurant. Overnight at hotel. Am : Breakfast at the hotel. 8h00 Drive southward to Mekong delta. Boat trip in MyTho through tiny canals and quiet villages. Lunch in nice restaurant inside garden. Afternoon transfer back Saigon with stop over in VinhTrang pagoda for visiting. Dinner and overnight in Saigon.